As in legacy LTE, LTE-BL/CE UE also start with RACH process to get the initial access to a network. There are commonality and differences in this process between legacy LTE and LTE-BL/CE. prach-ConfigIndex, prach-FreqOffset, rootSequenceIndex are common for legacy LTE and MTC (Ref ). But some more parameters are used in MTC to configure further details. These differences are described in 3GPP specification as follows. However, I found it very difficult to figure out real / detailed meaning of these differences just from the specification. I think I need to go through many TDocs to find out the practical meaning of these differences and further details of BL/CE RACH procedure. I will keep updating this page as I read through those TDocs. Based on 36.321 5.1.1, RACH Process for LTE-M1 device is modified from legacy LTE process as follows. instruct the physical layer to transmit a preamble with the number of repetitions required for preamble transmission corresponding to the selected preamble group (i.e., numRepetitionPerPreambleAttempt in SIB2) using the selected PRACH corresponding to the selected enhanced coverage level, corresponding RA-RNTI, preamble index or for NB-IoT subcarrier index, and PREAMBLE_RECEIVED_TARGET_POWER. Following is the overal protocol sequence of MTC(BL/CE) RACH process for Initial Access (Initial Registration). If you see the big picture, it would look very similar to RACH Process in Legacy LTE. The only outstanding difference would be you see a whole lots more arrows in MTC RACH process comparing to the process in legacy LTE. Actually the 'lots of arrows' is very important characteristics in MTC RACH and it is the most important differences between legacy LTE RACH and MTC RACH in detailed pictures. As you can easily guess, the multiple arrows at each step indicates the repetative transmission. i) Does this step require the repetative transmission ? ii) If it requires the repetition, how many times it has to repeat ? iii) How UE/eNB can figure out whether it should be repeated or not and how many times ? iv) Through which narrowband (Narrowband Index) this message should be transmitted ? 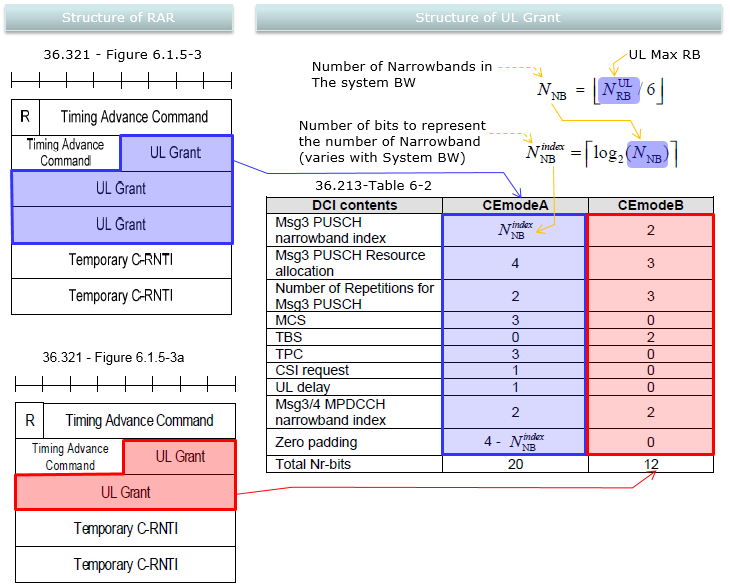 v) How UE/eNB can figure out which Narrowband should be used ? vi) Does this message should be transmitted in a fixed frequency ? or in hopping frequency ? vii) How UE/eNB can figure out whether it should be transmitted in a fixed frequency ? or in hopping frequency ? viii) What should be the timing gap between each steps ? NOTE : If you are working on verification or protocol stack implementation, you have to make it sure that Network populate valid (consistant among multiple parameters) the PRACH parameters SIB2 and UE (DUT) has successfully decoded SIB2 and has no complain about the parameter settings in SIB2. Even when UE successfully decoded SIB2, there is some possibility where UE does not like some of the parameter setting and print error. In this case, UE would not send PRACH preamble. Before UE send Msg1 (RACH Preamble), it has to determine what kind of RACH resource (time, frequency and preamble ID). Most of these resource information is notified to UE via SIB2 and some of the information (e.g, CE Level) is determined by UE based on cell power(RSRP) measurement. Followings are the list of information that UE figure out from higher layer signaling message (SIB2). 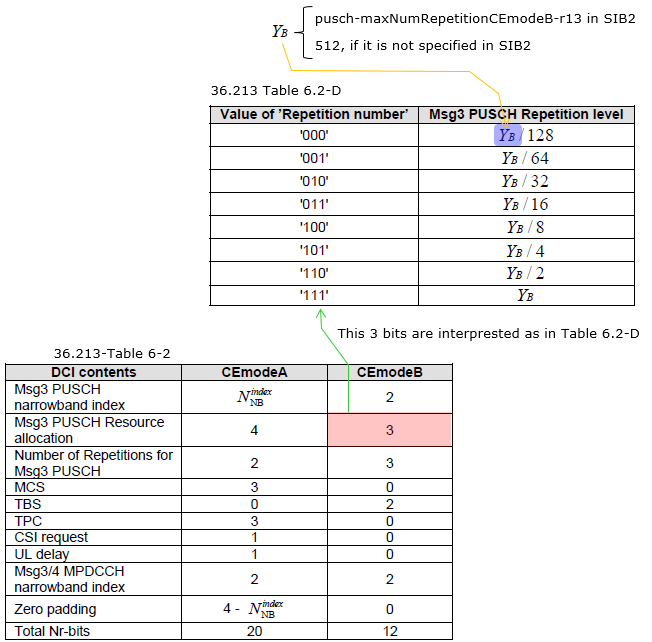 PRACH configuration is signaled based on Table 5.7.1.2~5.7.1.4 in TS 36.211. The signaling parameters for PRACH configuration are as follows (Refer to 36.211-5.7.1). All of them are in SIB2. PRACH can be transmitted in frequency hopping mode if following parameters are configured. (Refer to 36.211-5.7.1). All of them are in SIB2. NOTE : If UE log says it has sent PRACH Preamble and eNB log says that it has not received PRACH, you have to check all the detailed lower layer configuration both in UE and eNB. If you are at this stage, you might have already checked SIB2 and there wouldn't be any issues in SIB2 parameter itself. However, there might be problems of interpreting SIB2 parameters to lower layer configuration on UE or on eNB. For this kind of troubleshooting, you should have access to very detailed low layer logging tool for both UE and eNB, and you have knowledge to interpret those log. There are many cases where higher layer signaling parameter (SIB2 in this case) is not directly mapped to lower layer configuration and many cases higher layer specification and lower layer specification uses different terminology. So it would be very difficult (almost impossible) for a single person to understand everything. So you should have good contact to various engineers specialized in each separate layers. A certain period (3 subframs) after PRACH premable has tranmitted, UE start trying to decode MPDCCH carrying DCI that is required to decode RAR message. It means .. once eNB received RACH Preamble, the eNB would send MPDCCH carrying DCI for PDSCH carrying RAR. Regarding this MPDCCH, you would have a couple of questions listed below. In which narrowband the RAR will be transmitted ? Does MPDCCH for RAR be transmitted in repetition ? or transmitted only once ? How the repetition is configured ? When the first MPDCCH should be transmitted and how it is configured ? 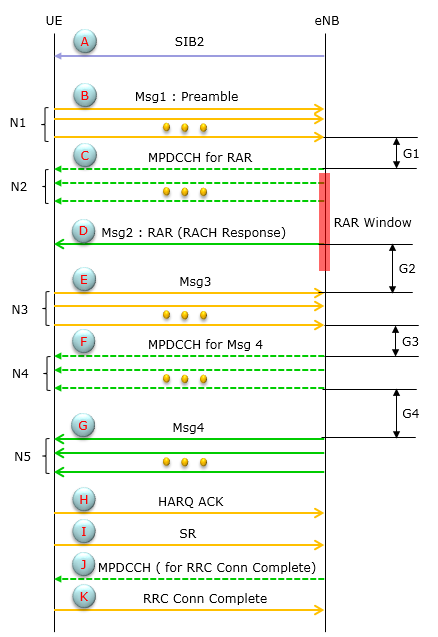 The narrowband for RAR MPDCCH (i.e, MPDCCH to decode the PDSCH carrying RAR) is determined by SIB2 parameter mpdcch-NarrowbandsToMonitor. This MPDCCH is being transmitted in repetition. The number of repetition is configured by mpdcch-NumRepetition-RA-r13 in SIB2. NOTE : The SIB2 parameter for this MPDCCH is simple. It is defined by mpdcch-NumRepetition-RA-r13, but this single parameter is related to a few other lower layer parameters and in terms of 3GPP specification, a pretty complicated procedure and hidden tables are involved. You need to understand every details of 36.213-9.1.5 MPDCCH assignment procedure. Without complete understanding of this process, it would be difficult to troubleshoot for this step. As in legacy LTE, RAR carries two critical information as follows. Resource Allocation Information for Msg3. The second part (i.e, Resource Allocation Information for Msg3) is made up of following information. As you see, depending on CE mode the bit field structure varies. Most of the field in this structure is pretty straight forward but there some field that are a little challenging to understand mainly due to the nature of repetition and you would need some other tables as follows. 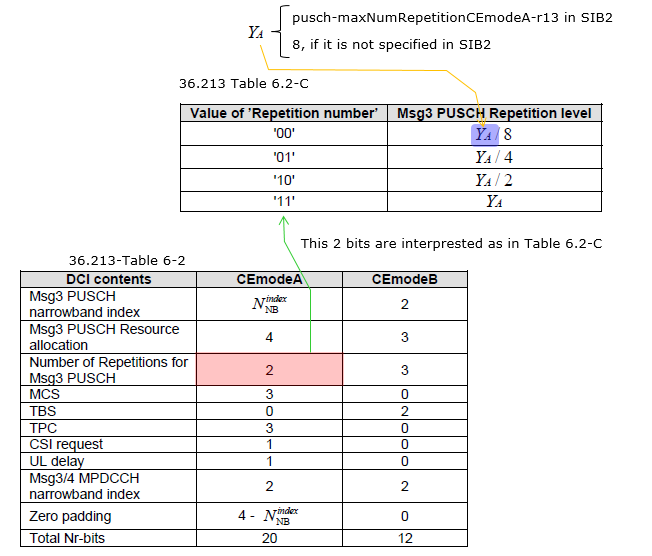 The narrowband index for Msg PUSCH in CEmodeA is directly defined by the field 'Msg3 PUSCH narrowband index', but the meaning of 'Msg3 PUSCH narrowband index' in CE mode B is determined by another table a shown below (This table defines the Msg3 PUSCH narrowband index for the first transmission. The narrowband index for the retransmitted Msg may change by some other factors) . NOTE : NB_RAR in this table is determined by higher layer signaling parameter mpdcch-NarrowbandsToMonitor-r13 in SIB2. With this, do you think you can interpret all of the field in RAR(36.213-Table 6-2) ? Unfortunately, No. 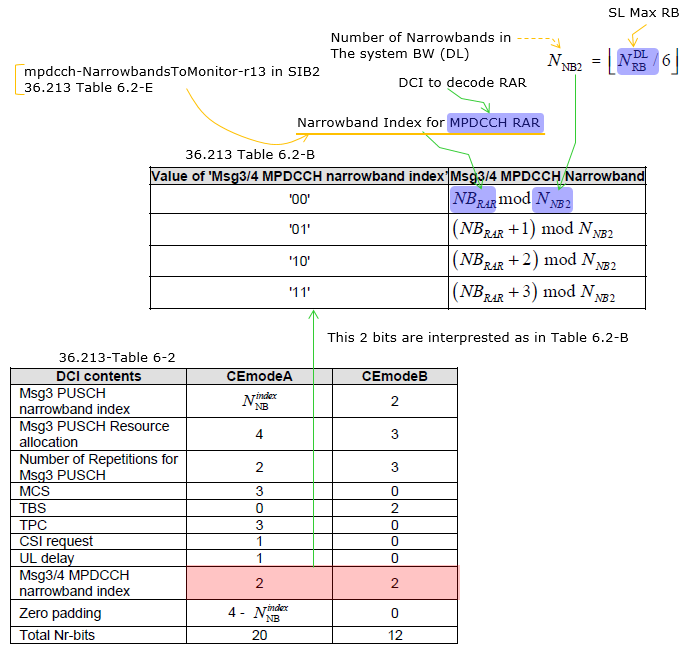 You need another table to interpret the field Msg3/4 MPDCCH narrowband index. The interpretation of this field comes from following table. You see a parameter NB_RAR in Table 6.2-A and 6.2-B. That parameter is defined by another table shown below. 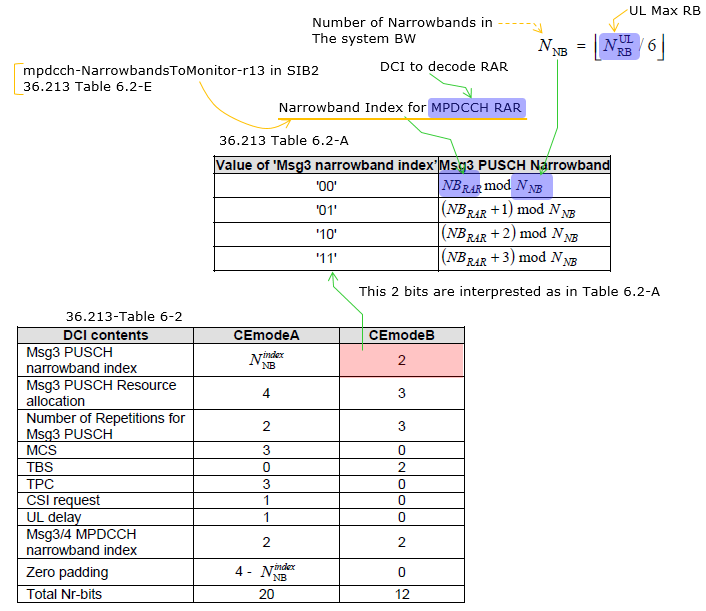 As you see here, NB_RAR is determined by mpdcch-NarrowbandsToMonitor-r13 and whether Preamble Index is even or odd. Yes , I know... it would be so confusing to follow through all of these tables and get some clear meaning out of the RAR message. Once UE completed the Step (D), that is, decoding the contents of RAR, UE send Msg3 (RRC Connection Request). Before UE send this message and Network trying to receive this message, they both should know of the following information. In which narrowband the message will be transmitted ? Will it be transmitted in repetition ? How many times ? Which MCS, TBS is used for this message ? The answer is simple as follows. As soon as UE transmit the Msg3(RRC Connection Request), UE start monitoring (trying to detect) the MPDCCH that is needed to receive Msg4 PDSCH (i.e, the PDSCH carrying Msg4). For UE to properly decode this channel, it has to know of following params. Which Narrowband is used to carry the MPDCCH ? From which OFDMA symbol is the MPDCCH allocated (assinged) ? How many PRB pairs are used to carry this MPDCCH ? The answer to these questions comes from RAR and SIB2 as follows. Once UE has decoded MPDCCH for Msg4 decoding, it decode Msg4 (MAC CE for Contention Resolution) and it completes RACH process if there is no problem with CR. Usually this CR and RRC Connection Setup message is carried in the same MAC PDU.